CRINCH! The Crab of the Day! Re: CRINCH! The Crab of the Day! Photo Credit: Stefano Guerrieri di Livorno. CRINCH! #CrabOfTheDay for 05/06/2017: Ilia nucleus, or The Spanish Nut Crab, is a small, deep-dwelling species of widely distributed Atlantic Ocean round crab. Known for inhabiting the waters of Spain and Italy, this subtropical silt-filterer will remain hidden during the day, preferring night time for scavenging meals. Ilia nucleus feeds on small invertebrates that live in the sand, namely polychaetes and small crustaceans. Usually a carrot orange color, this crab’s carapace can also be black or light beige or even appear transparent in young individuals. Due to the shape of his body and hampered by his long claws, this crab moves slowly and totally lacking in agility. FUN FACT: The Latin “Ilia” means ‘ belly.’ The word “Nucleus” in this context means ‘central or globular.’ Makes sense! CRINCH! #CrabOfTheDay for 05/08/2017: Calappa gallus, The Rough Box Crab- also called the ‘Lumpy Box Crab,’ the ‘Yellow Box Crab, ’Poki Poki,’ (Hawaii) and ‘Kobukarappa.’ (or コブカラッパ in Japanese.) This tropical/benthic family Calappidae animal can be found in just about every tropical latitude ocean or sea on Earth, and is considered the most widely distributed “Shame-Faced” crab. Like with other genus Calappa crabs, C. gallus can fold its claws and legs against its central carapace, appearing to be dead or inanimate. Additionally, these crabs can readily burrow into the sand, creating breathing channels in the process. Photo Credit: Peter Ng & Hironori Komatsu. CRINCH! #CrabOfTheDay for 05/09/2017: Nursia tohae, or “Toh’s Coral Rubble Mimic Crab is a small, triangle-shaped leucosiid crab, found only in Panglao, the Philippines, and Pulau Hantu in Singapore. Similar in morphology to both N. alata from Japan and a few species of genus Oreotlos crabs, Toh’s Coral Rubble Mimic has a creamy to yellowish-white body, capable of blending in perfectly with the muted colors found on corals and substrate in this crab’s environment. These crabs resemble pieces of coral rubble so well that it is almost impossible to see them unless they move! CRINCH! #CrabOfTheDay for 05/10/2017: Pachycheles pisoides, called The Thick Pea Porcelain Crab, (豌豆厚瓷蟹 or “Wāndòu hòu cí xiè” in Chinese/ ミナミコブカニダマシ or “Minamikobukanidamashi” in Japanese.) 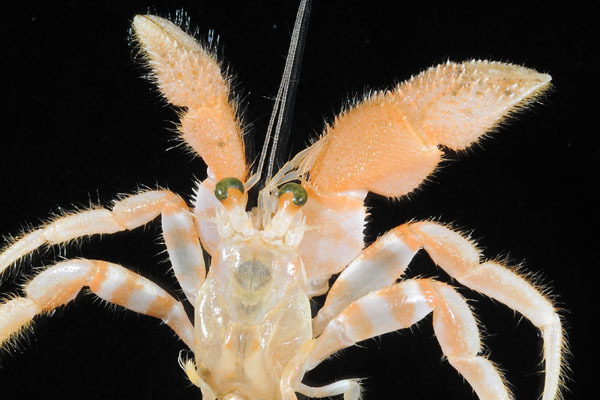 is a species of family Porcellanidae “Porcelain Crab” found in New Zealand, Seychelles, French Polynesia, China, Japan, The South Pacific Islands, and New Caledonia. This Shallow water/Intertidal species has an amazingly iridescent brown-to-red shell, covered with long, stiff setae. Additionally, the frontal antennae of P. pisoides, have long, seaweed-like filaments. FUNFACT: Thick Pea Porcelain Crab was first described by Austrian botanist and naturalist, Karl Bartholomäus Heller in 1865. CRINCH! #CrabOfTheDay for 05/11/2017: Cyclograpsus insularum, or The Northern Smooth Shore Crab, is a family Varunidae shore crab found in the Pacific, though mainly on the Northwestern beaches of New Zealand. Called “Akaisogani” (アカイソガニ) in Japanese, this species is very closely related to Cyclograpsus lavauxi, though C. insularum is considered very rare and had been collected only six times since 1929. Found under boulders high on the beach, Cyclograpsus insularum digs through substrates of smaller sand and silt, in search of edibles. 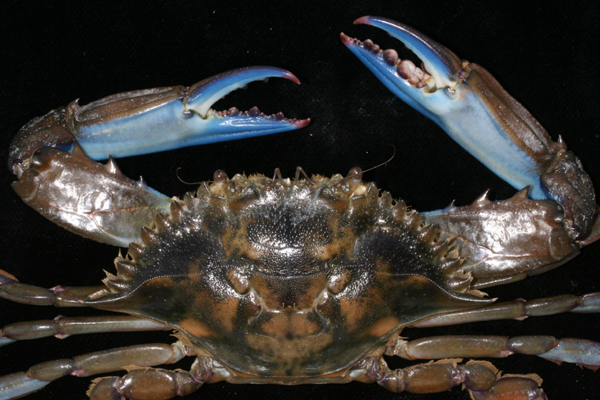 FUNFACT: “Smooth Shore Crabs” are named so because both the surface and cutting edge of their claws are super smooth! Photo Credit: Moorea Biocode, 2009. CRINCH! #CrabOfTheDay for 05/12/2017: Caphyra yookadai, called “Tosakagazami” (トサカガザミ) in Japanese, is a beautifully speckled family Portunidae swimming crab found in Australia, New Zealand, Japan, China, and allegedly, Madagascar. This Sakai-described species (1933) has an almost ‘shining’ carapace with stunning red spots. Despite being fully capable of short swims, (like all swimmers, C. yookadai has last-pair paddle legs) the Tosakagazami prefers hiding among the feather corals that it lives commensally on. Photo Credit: 'David R.' iNaturalist.org. CRINCH! #CrabOfTheDay for 05/13/2017: Charybdis hawaiensis, called The Hawaiian Swimming Crab and sometimes, The Hawaii Rock Crab is an Indo-Pacific swimming crab from family Portunidae. Common at scuba depths in rocky holes and generally associated within varieties of Antler coral, this diminutive swimmer seldom attains carapace width of greater than 3 inches across. CRINCH! 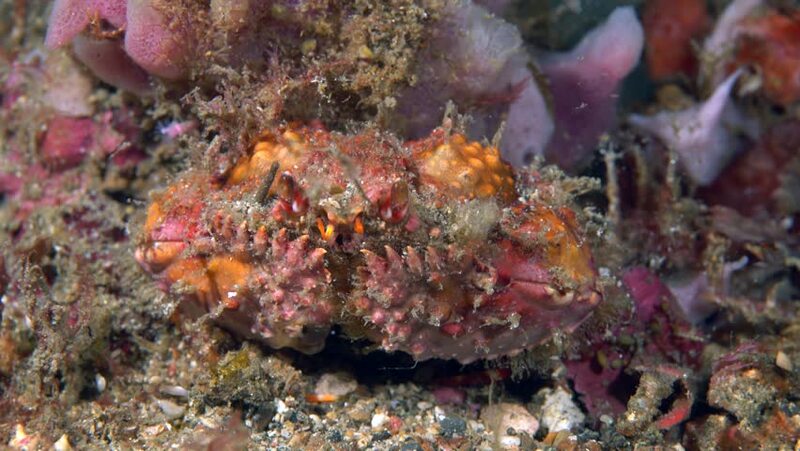 #CrabOfTheDay for 05/14/2017: The Bristled Sponge Crab, or Austrodromidia octodentata, is a species of Australian carrier crab, known for ‘wearing’ a chunk of colonial Ascidian sponge like a hat on its back. This odd crab is covered by a thatch of dense, brown hairs, and has stunning orange eye stalks, and blue legs. Combined with its comically round carapace and blue-tinted mouthparts, this species looks pretty ridiculous! Laugh at your own peril however, with its complete camouflage scheme, A. octodentata makes for a pretty effective ambush carnivore! CRINCH! #CrabOfTheDay for 05/15/2017: Lydia annulipes, or The Sand Ring Crab is an Indo-African/Pacific species known as “Kibaougigani” in Japan (キバオウギガニ) and “Huán wén jīnshā xiè” in China. (环纹金沙蟹) This family Oziidae species lives in tropical tidal reefs at the shallow depth range (0 - 5 m) from Somalia to Madagascar and Cocos Islands. A diminutive species, L. annulipes seldom reaches more than 17 mm across the carapace. Photo Credit: Dr. Scott Mills. Funfact: E. sebana is toxic, due to its diet of toxic nudibranchs and shellfish and is not fit for consumption. The cocktail of toxins in its body behave like saxitoxin, neosaxitoxin, gonyautoxin-1 and gonyautoxin-2. CRINCH! #CrabOfTheDay for 05/17/2017: Xanthias lividus, (previously Xantho lividus) or The Purple Reef Crab is a family Xanthidae species found in mid-latitude tropical Indo-Pacific waters. Called “Murasaki Hime-ougigani” (Purple Princess Crab or ムラサキヒメオウギガニ) in Japanese, this low-tide crab is so infrequently seen it is often mistaken for other species. 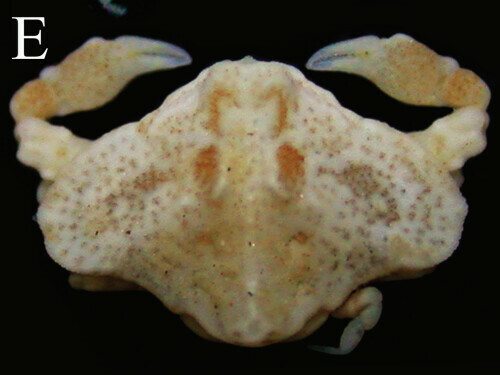 Like many related species of reef crab, X. lividus has a body ripe with paralytic tetrodotoxin of the ilk usually found in mollusks and other shellfish. Photo Credit: Robert Aguilar, Smithsonian Environmental Research Center. CRINCH! #CrabOfTheDay for 05/19/2017: Lepidopa websteri, or Webster's Mole Crab, is a family Albuneidae species of Surf Crab (Mole Crab) found in The Gulf of Mexico and The North and West Atlantic Ocean. Identifiable by their “Super long antennae,” L. websteri- first described in 1903, is a rarely collected species as it stays relatively scarce. Partially due to the fact that its long antenna make it an easy target for birds, there’s carcinological speculation that the antennae act as straws, allowing it to dig deeper burrows. CRINCH! #CrabOfTheDay for 05/21/2017: Pilumnus pannosus, called The Beaded Hairy Crab, is a family Pilumnidae species found in the Gulf of Mexico and from Florida, the Virgin and Antilles Islands and the West Indies. This hardpan and rubble dweller stays in the 1-20 m depth range, and will occasionally venture in to brackish bays and stream mouths. 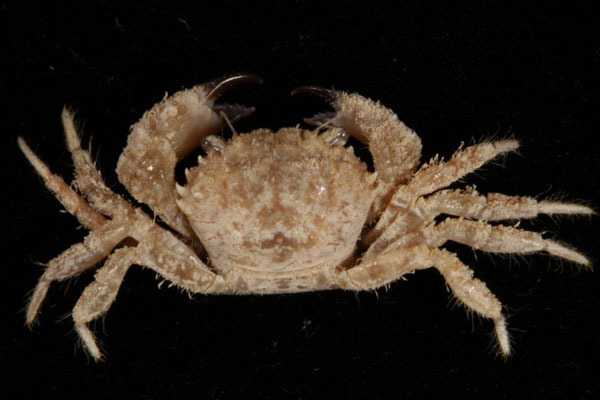 This tropical, Rathbun-cataloged crab is named for its covering of setae and the fact that its claws and carapace are dotted with bead-like tubercles and truncate spines. Photo Credit: Marshall B. Bishop. CRINCH! #CrabOfTheDay for 05/22/2017: Gemmotheres chamae, also known as the Jewel-Box Pea Crab, is a GROSS family Pinnotheridae species found in the US adjacent Western Atlantic Ocean. 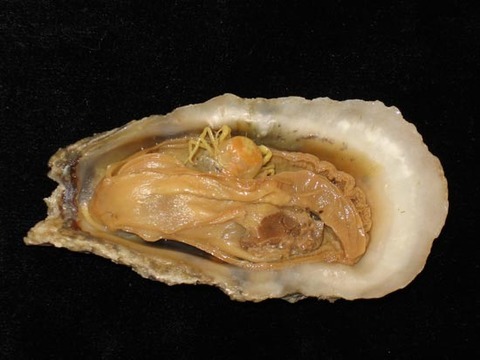 A “monotypic” animal, or in plain terms, the only member of its genus- G. chamae lives in a commensal relationship in the gill margin of the Corrugate Jewelbox Clam, Chama congregate; a species of “cemented saltwater marine bivalve mollusks.” Say that ten times fast! CRINCH! #CrabOfTheDay for 05/23/2017: Tomopagurus wassi, or Wass's Hermit Crab, is a rather cryptic species of ‘Golden Hermit’ found in the Western Atlantic; from The Caribbean to The Gulf of Mexico and the Yucatan. Covered in a bevy of spines and setae, this hermit is rather hard to spot against the corals it lives on. This family Paguridae animal has some impressive depth tolerances, able to survive from 75m to 360 m. Re-catalogued in 1981 by P. McLaughlin, this crab was named for Ed F. Wass- who in-turn catalogued Tomopagurus chacei in 1963, named for Chace, who worked with Haig to name a third member of the genus, Tomopagurus maclaughlinae, as you guessed, after Patty McLaughlin in 1976. Photo Credit: R. Marraud des Grottes. CRINCH! #CrabOfTheDay for 05/24/2017: Ucides cordatus, or The Swamp Ghost Crab, is a species of Neotropical Mangrove crab, found in brackish delta estuaries in the Atlantic, from the US through the Antilles and Brazil. This broad and bright egg-shaped crab serves an important bioturbation role by aerating the soil in mangroves, via its burrows. 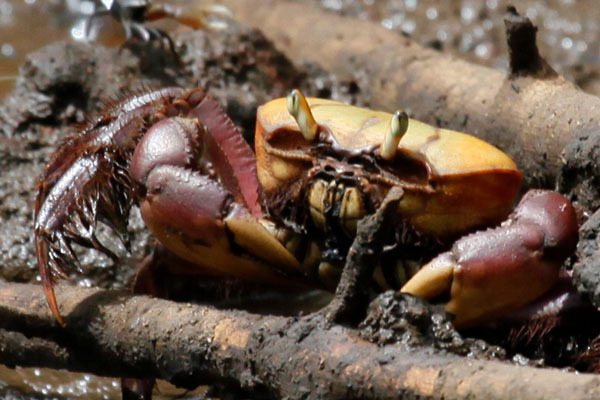 Widely known as “the most sluggish of the land crabs,” these detritivorous herbivores feed primarily on mangrove leaves, both fresh and decomposing. 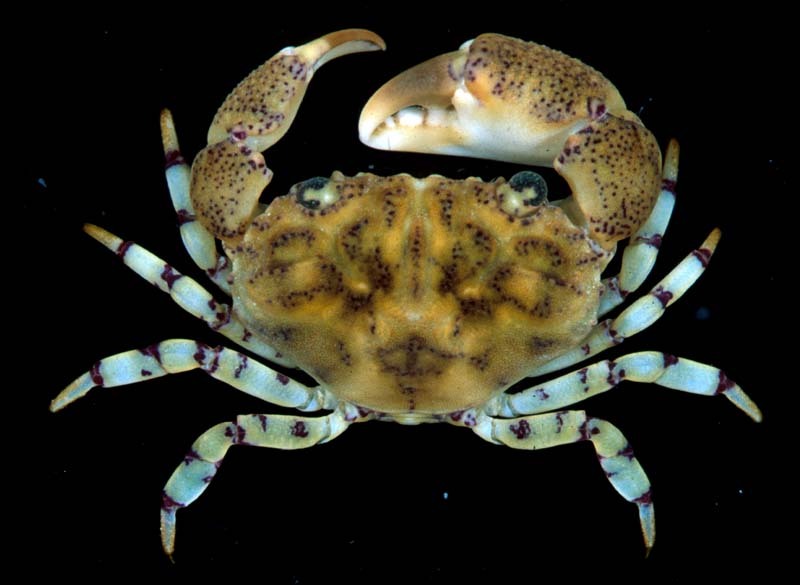 FUNFACT: Ucides is a genus of mangrove crabs in the monotypic family Ucididae, containing two species: Ucides cordatus from the mid-US Atlantic through Central America, and Ucides occidentalis inhabiting the mid-US Pacific through South America. CRINCH! #CrabOfTheDay for 05/25/2017: Lucifer typus, or The Marked Ghost prawn is a bizarre ‘degenerate’ (more primitive) sergestid shrimp, found in Atlantic, Mediterranean and Indo-Pacific waters. Possessing a long body, but many fewer appendages than other more developed prawns, these animals are readily identifiable by their odd conjoined eyestalk. Called Dream Shrimp, or ‘Yumeebi’ (ユメエビ) in Japanese, this family Luciferidae crustacean uses bioluminescence for an as-yet not understood purpose. FUNFACT: The name Lucifer is latin for "light bearer," and was given to the genus because of these prawns' use of bioluminescence. CRINCH! #CrabOfTheDay for 05/26/2017: The Nodose Box Crab, or Calappula tortugae (Rathbun, 1933) is a reef camouflage-patterned species of “shame-faced crab” found on the Eastern side of the Central American Isthmus. Its sister-species, and only other member of genus Calappula- C.saussurei, is only found on the Western side. These family Calappidae crabs are not only masters of blending in, they can also dig incredibly quickly! These mid-depth dwellers live at 200 m and greater, where seafloor muck makes for an easy meal. Photo Credit: Poupin & Corbari. CRINCH! #CrabOfTheDay for 05/27/2017: Laleonectes vocans, or The ‘Calling Crab’ is a family Portunidae swimming crab found in the Western Atlantic- namely The Gulf of Mexico, Brazil, the Caribbean, and associated distant islands. 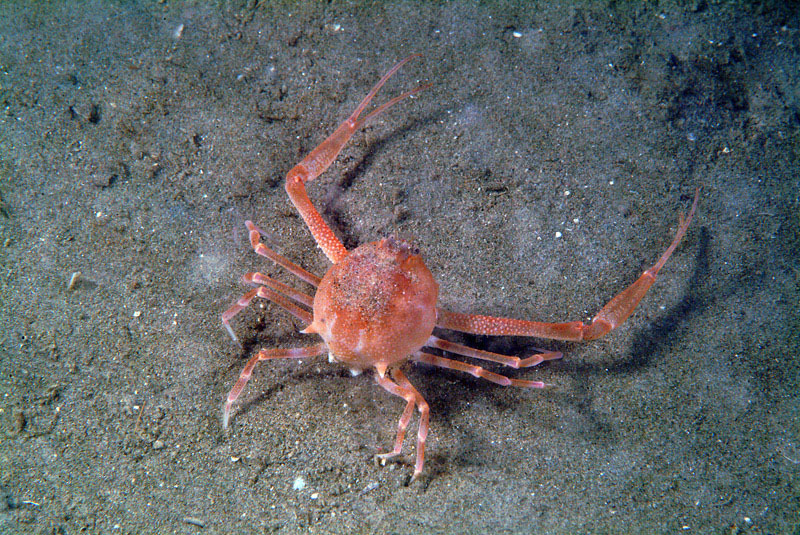 This crab is identifiable by an irregular pattern of red and purple spots, infrequent carapace granules, and a series of orange bands on its legs. Known to generally prefer hiding under rocks and on the soft substrate associated with seamounts and knolls, L. vocans is nevertheless a predator, and will just as quickly swim down and eat a live meal as it will scavenge detritus. 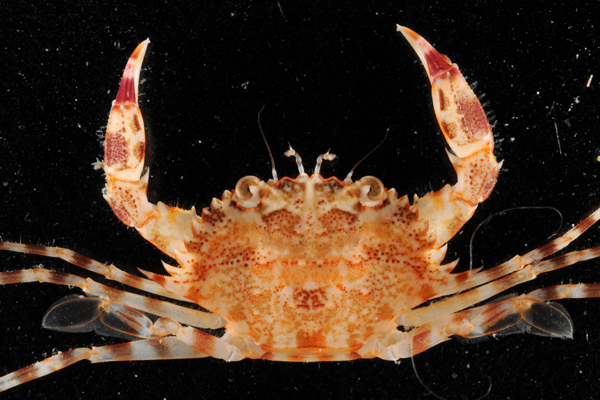 Calling Crabs have been found at depths as shallow as 5 m all the way to the deep waters at around 320 m.
6-309 m. Previously labeled both Neptunus vocans and Portunus vocans, Laleonectes vocans is said to make small scrapes and squeaks with its carapace which divers swear they can hear underwater. CRINCH! #CrabOfTheDay for 05/29/2017: Aethra edentata, Or The Flat Elbow Crab is an Indo-Pacific family Aethridae species of “Elbow Crab,” found mainly in the Mozambique Channel, Hawaii, Australia, and other parts of the South Pacific Ocean. 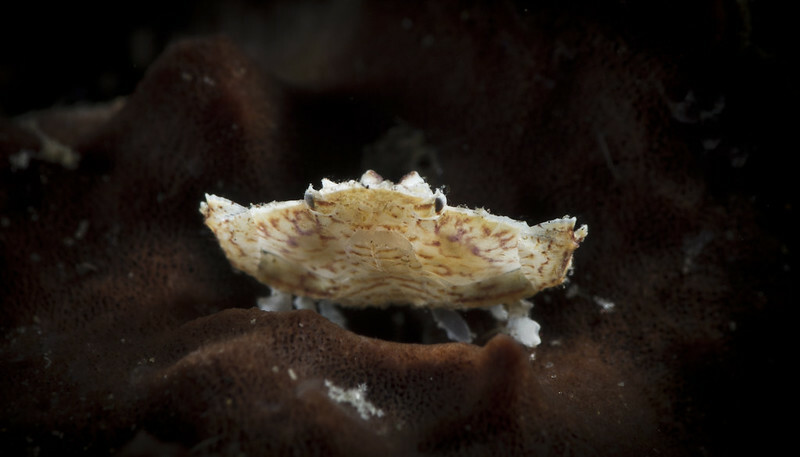 Also called the “Potato-Chip Crab,” this small, white crab uses its unusual carapace to blend in on white rockpools and pale or bleached corals. FUNFACT: In Greek mythology, Aethra (or Aithra) means “the bright sky," and was a name applied to four different individuals in history and mythology. Photo Credit: Hsi-Te Shih, 2015. FUNFACT: Scopimera is made up of the Latin words scopi meaning "broom” and mera meaning “clean, pure, or transparent," thus: clean sweep crabs! CRINCH! #CrabOfTheDay for 05/31/2017: Callinectes marginatus, known as The Sharptooth Swimming Crab, and sometimes The Marbled Swimming Crab or Masked Swimming Crab, is a family Portunidae species of swimmer found in both the Eastern and Western tropical Atlantic. Possessing nine spines behind each eye, the last of which is around twice the length of the previous ones and twice as sharp, it’s easy to see why Mary Rathbun gave this crab the ‘Sharptooth ‘name. 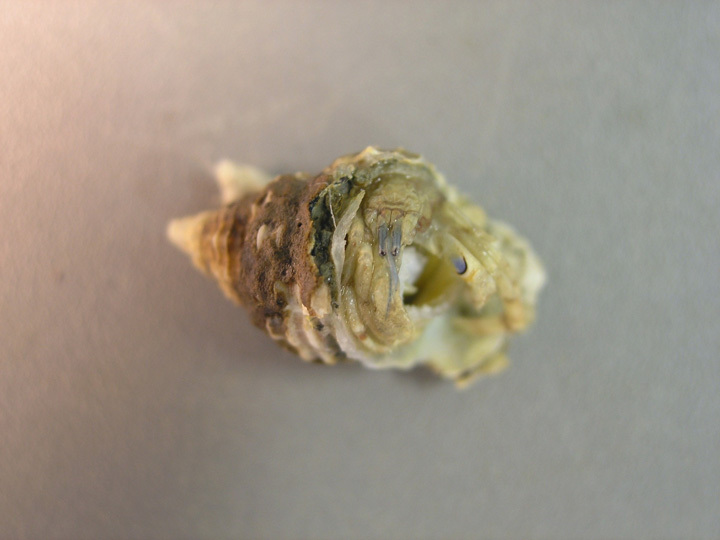 Though typically a marine crustacean, C. marginatus also thrives in brackish estuaries where it can actually burrow in the muck. Photo Credit: FWC: Fish and Wildlife Research Institute. CRINCH! #CrabOfTheDay for 06/01/2017: Carpoporus papulosus, also known as The Narrowfront Rubble Crab, is a highly specialized species of rubble crab, found in West Atlantic, Caribbean, and African waters. 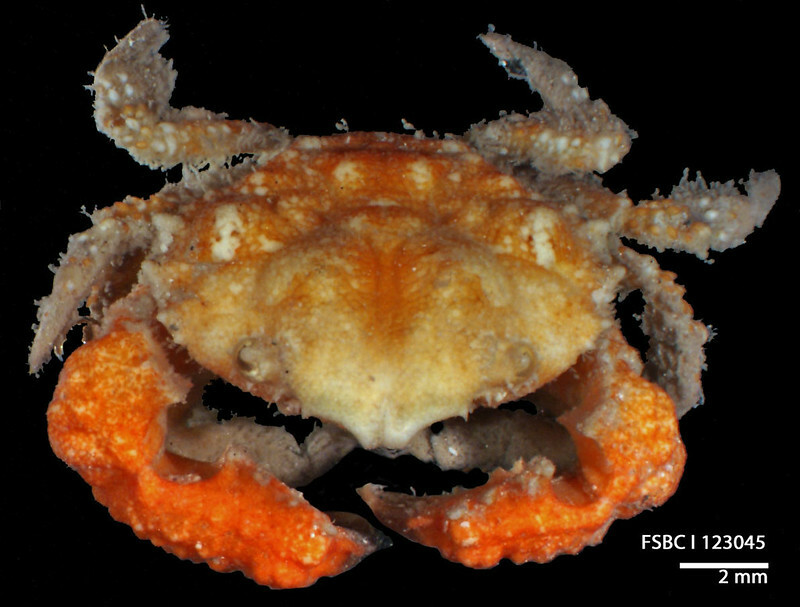 This family Xanthidae crab stands as the ONLY species in the genus Carpoporus, making it a monotypical rarity. C. papulosus has some rather distinct cavities at each side of its hepatic (central body protecting the liver, heart, and guts.) region, the exact purpose of which is at present, unknown. Additionally, this Stimpson (1871) catalogued animal has stubby chelipeds and legs, and is covered by an irregular patterning of bristly setae. Photo Credit: Frogs of Borneo, 2017. CRINCH! #CrabOfTheDay for 06/02/2017: The Crab-Eating Frog (Fejervarya cancrivora), is a frog native to South-Eastern Asia, and other Indo-Pacific Waters. Sometimes called the Mangrove Frog, this amphibian lives in the saline/brackish inlets where mangrove swamps and marshes are plentiful. F. cancrivora stands as the ONLY frog capable of tolerating brief excursions into sea water. This process is made possible by a ramp-up in the frog’s urea production/retention, putting the frog into a slightly hyperosmotic state, or similar salinity to the surrounding sea water. Furthermore, this species has tadpoles which can survive salinities as high as 4 percent! 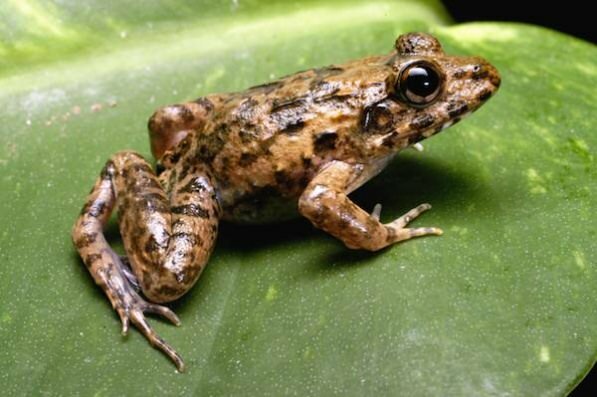 Like its name suggests, this frog primarily preys on insects and small crustaceans, including various MANGROVE CRABS! Because of this diet, this frog’s meat is considered a delicacy by Southeast Asian locals. Photo Credit: Brenda Bowling, Texas Parks and Wildlife Department. CRINCH! #CrabOfTheDay for 06/04/2017: The Blue-Spot Hermit Crab, or Areopaguristes hummi is a diminutive family Diogenidae (Left-handed hermit crabs) species found in The Gulf of Mexico, West Atlantic, Central America, and Venezuela. This off-white species is named for the singular black-bordered blue spot on its larger (left) cheliped. Blue-Spot Hermits are members of a taxonomically-unstable 3 member genus- ‘Areopaguristes’ has been reclassified more than 6 times! As of now, the genus is regarded as aberrant- or not conforming completely to the trait schema of family Diogenidae. CRINCH! #CrabOfTheDay for 06/05/2017: Liocarcinus vernalis, (Risso, 1827) or The Grey Swimming Crab, is a small, commonly seen mid-depth swimmer, found all over the East Atlantic: from almost the WHOLE of Europe to the Middle East, and the Mediterranean and Levantine Seas. This predatory crab will eat many meals of opportunity, but is known for taking down smaller crustaceans! A family Polybiidae crab, L. vernalis typically spends a fair amount of time in the fine sands common at its chosen depths.